Church pews may be full of teenagers, but a new study says college students might be a much rarer sight on Sunday mornings. 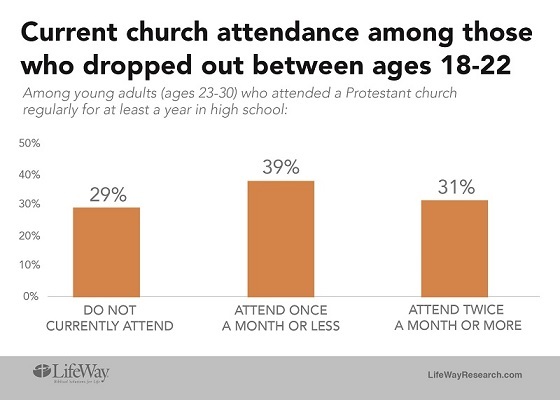 Two-thirds (66 percent) of American young adults who attended a Protestant church regularly for at least a year as a teenager say they also dropped out for at least a year between the ages of 18 and 22, according to a new study from Nashville-based LifeWay Research. Thirty-four percent say they continued to attend twice a month or more. While the 66 percent may be troubling for many church leaders, the numbers may appear more hopeful when compared to a 2007 study from LifeWay Research. Previously, 70 percent of 18- to 22-year-olds left church for at least one year. “The good news for Christian leaders is that churches don’t seem to be losing more students than they were 10 years ago. However, the difference in the dropout rate now and then is not large enough statistically to say it has actually improved,” said Scott McConnell, executive director of LifeWay Research. The dropout rate for young adults accelerates with age, the study found. While 69 percent say they were attending at age 17, that fell to 58 percent at age 18 and 40 percent at age 19. Once they reach their 20s, around 1 in 3 say they were attending church regularly. “Overall Protestant churches see many teenagers attending regularly only for a season. Many families just don’t attend that often,” said McConnell. Virtually all of those who dropped out (96 percent) listed a change in their life situation as a reason for their dropping out. 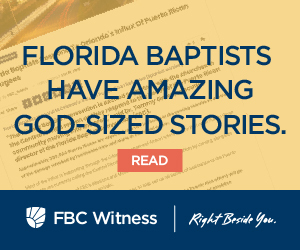 Fewer say it was related to the church or pastor (73 percent); religious, ethical or political beliefs (70 percent); or the student ministry (63 percent). 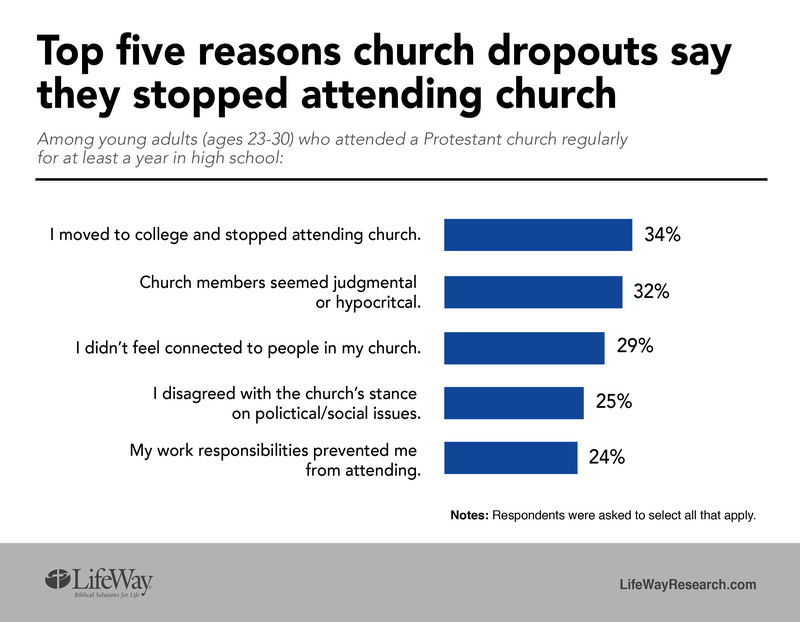 The five most frequently chosen specific reasons for dropping out were: moving to college and no longer attending (34 percent); church members seeming judgmental or hypocritical (32 percent); no longer feeling connected to people in their church (29 percent); disagreeing with the church’s stance on political or social issues (25 percent); and work responsibilities (24 percent). Almost half (47 percent) of those who dropped out and attended college say moving to college played a role in their no longer attending church for at least a year. Among all those who dropped out, 29 percent say they planned on taking a break from church once they graduated high school. Seven in 10 (71 percent) say their leaving wasn’t an intentional decision. “For the most part, people aren’t leaving the church out of bitterness, the influence of college atheists, or a renunciation of their faith,” said Trueblood. Not all teenagers leave church as a young adult. A third (34 percent) say they consistently attended twice a month or more through the age of 22. Those who stayed saw the church as an important part of their entire life. When asked why they stayed in church, more than half say the church was a vital part of their relationship with God (56 percent) and that they wanted the church to help guide their decisions in everyday life (54 percent). Around 4 in 10 (43 percent) say they wanted to follow the example of a parent or other family member. Similar numbers say they continued to attend because church activities were a big part of their life (39 percent), they felt church was helping them become a better person (39 percent), or they were committed to the purpose and work of the church (37 percent). Among all young adults who attended church regularly at least one year as a teenager, almost half (45 percent) currently attend at least twice a month, including more than a quarter (27 percent) who attend once a week or more. Another 8 percent say they attend once a month, while 25 percent say they attend a few times a year. Twenty-two percent of those who attended regularly at least one year as a teenager now say they do not currently attend at all. Among those who dropped out for at least a year, 31 percent are currently attending twice or month or more. Among those who attended a Protestant church as teenager, 7 in 10 say they’re Protestant now. Another 10 percent identify as Catholic. Few say they are agnostic (4 percent) or atheist (3 percent). “While some young adults who leave church are rejecting their childhood faith, most are choosing to keep many of the beliefs they had, but with a smaller dose of church,” said McConnell. For more information on the study, visit LifeWayResearch.com or view the complete report. A graphic video of the information is available at LifeWay’s YouTube page. A demographically balanced online panel was used for interviewing American adults between the ages of 23 and 30 years old. The study was sponsored by LifeWay Students. The survey was conducted September 15 – October 13, 2017. Slight weights were used to balance gender, ethnicity, education, and region. The sample was screened to only include those who attended a Protestant church regularly (twice a month or more) for at least a year in high school. The completed sample is 2,002 surveys. The sample provides 95 percent confidence that the sampling error from the online panel does not exceed plus or minus 2.4 percent. This margin of error accounts for the effect of weighting. Margins of error are higher in sub-groups. Comparisons are made to a LifeWay Research online survey of 1,023 young adults ages 18-30 in April-May 2007.